Do you need to do a little undercover surveillance work or fancy yourself as a bit of a 007 secret agent? If yo do you might be interested in adding the professional iCharger iPhone charger, spy camera to your arsenal of surveillance gadgets. The iCharger spy camera been designed to look like a simple iPhone charger but hidden inside its innocuous casing is a 450 TVL Colour CCD Camera that features motion activated recording and records MP4 video files, complete with time and date stamps. It comes equipped with a 4 GB SD card which is expandable to 32 GB if required, and can even be connected to your TV for viewing on a big screen at a later date. It will also charge and Apple iPad if required. 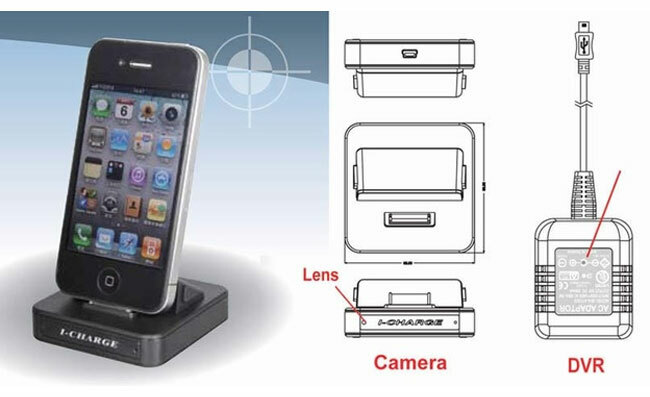 The new iCharge iPad / iPhone Docking Station Covert Hidden Camera system is now available to purchase for around $400.